We need to ensure that the project moves forward at the desired rate, and delivers real value to its customers. This needs to be a clear expectation for every team member. Have you worked with teams, who had little idea or interest in the result, delivering solutions to customers? Where they also didn’t know what the customers were paying for or how much value was going to be produced for the customer? In those situations, it isn’t surprising that the delivery efficiency was not very high because their role was primarily delivery assurance: to make sure that something was eventually delivered, not to maximise the delivered benefit to the customer. This sort of complacency is all too common in organisations. We need to create a “sense of urgency”, and to do this we need to focus on three elements: value, speed and passion. More information can be found in Project Action Principle #1 and in Project Action Principle #2. The team delivers outcomes that are expressed in terms of value for the customer. Projects that are not value-focused tend to lose direction because they do not have a clear and tangible goal. They often get lost in the constraints of the chosen technologies and/or the complexity of the delivery process. Get it done, now! Not only does the customer want the benefits as soon as possible, but the team deserves the opportunity to succeed. This is as critical is from the start of the project to the very end. Speed and urgency should not only be applied near the finish line or when things go wrong. If there is lag in the early stages of the team formation, there will be problems getting the project completed on time because the effect will usually be multiplied downstream. There is no greater, but unacknowledged, risk to project delivery than the duration of project execution – Adam Russell. The longer the project is in flight, the more likely it is to get zapped by some major event: re-organisation, change in strategy, funding issues, market downturn, etc. Be passionate! Why are we doing this if not to do it well, generously and fully? Passion comes from commitment and/or from a delight or enjoyment in the subject matter. This passion generates energy, which assists with speed. Try this simple test to see how knowledgeable and aligned you are. Write down 25 words or so that describe the customer value that your project is delivering. Then ask your team mates the same, and compare all the responses. Very few project teams (excluding the business leads) will describe their project objectives in terms of the problem that they are trying to solve. In an Agile team, the probability is much higher. But many Agile methodologies, like Scrum, still intermediate between the team and the end-customer via the Product Owner. This is the kind of knowledge that can only come from direct engagement with the customer’s situation. Once a person can feel the customer’s pain and has empathy for the customer’s situation, they are more likely to develop a commitment to resolve that situation. The more committed a passionate team is, the less likely they will focus on blockages and potential problems. It’s easy to be distracted by issues when people don’t really believe in the outcome. Passionate team members “suspend disbelief” in their ability to overcome difficulties in future tasks and are more likely to back themselves to achieve difficult goals. This attitude builds the pace of the project, and brings intermediate goals sooner. 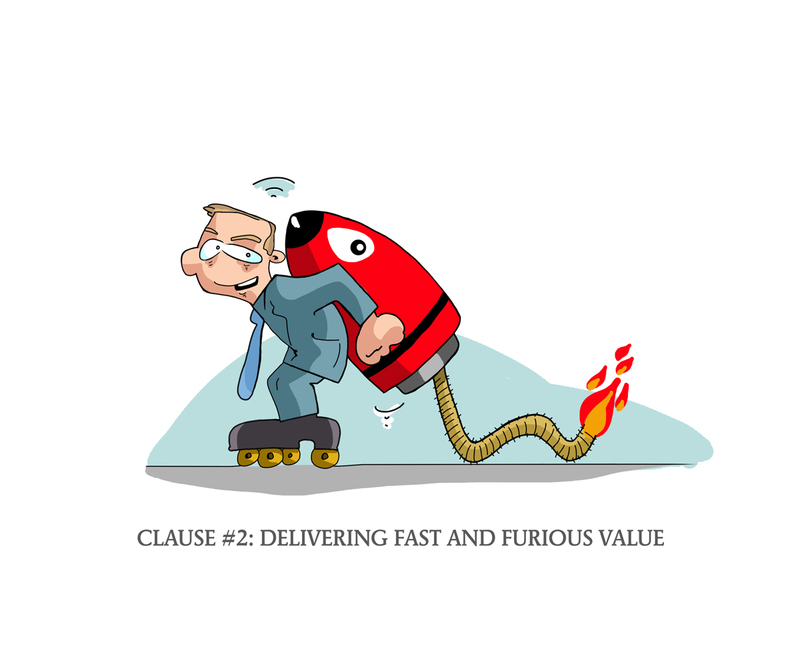 This clause ensures that the project moves forward at the desired rate, and delivers real value to its customers. I understand that this project team has been formed to deliver value to some person or organisation, who I will think of as my customer(s). I commit to developing an understanding of this value to the customer and to fostering this value in my day-to-day activities. I commit to defining the value of my work in terms of end-customer’s needs. I will work to encourage a continual focus on the end-delivered value. I will make it a personal responsibility to understand and empathise with that value in the way that our customer(s) see it. Because it is not just the responsibility of the project manager or business lead. Our team has an obligation to get our project done as quickly as practicable, and as inexpensive as we can manage to meet the optimal capabilities. All cost/time/value trade-off decisions are not ours, but our customers. We do not have a right to extend the project arbitrarily, to opportunistically expand work to spend approved budget, or to consume an agreed amount of time. What do you think your team’s reaction would be to this Charter, if you introduced it to your current project(s)? We’d love to read your comments, so please use the area below the article to provide feedback.